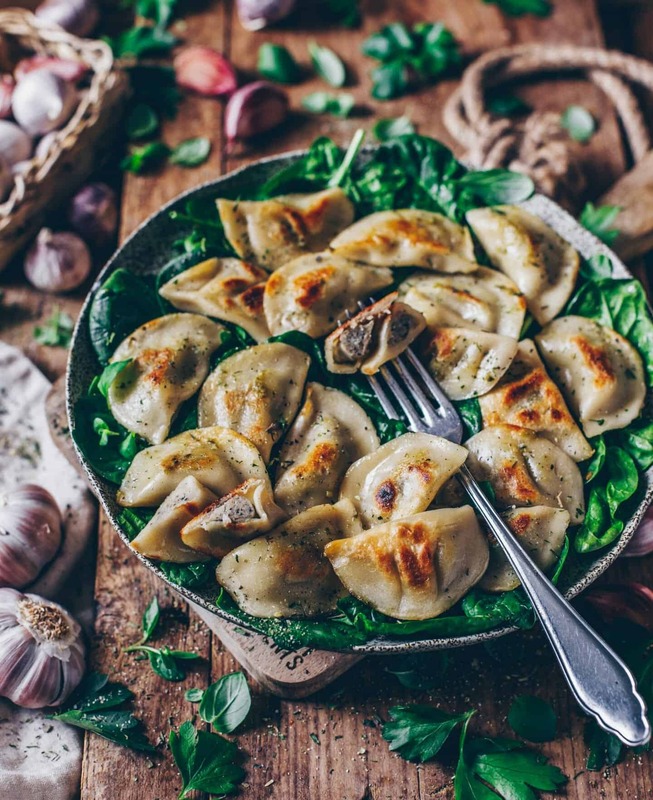 Recipe for vegan pierogi (stuffed pasta pockets/ vegan ravioli) with a mushroom potato filling. It’s very delicious and original from grandma‘s kitchen! Do you know this feeling, when a certain dish or just the smell of a certain dish reminds you back to your childhood in just a few seconds? That’s how I feel about this dish: Vegan Pierogi! 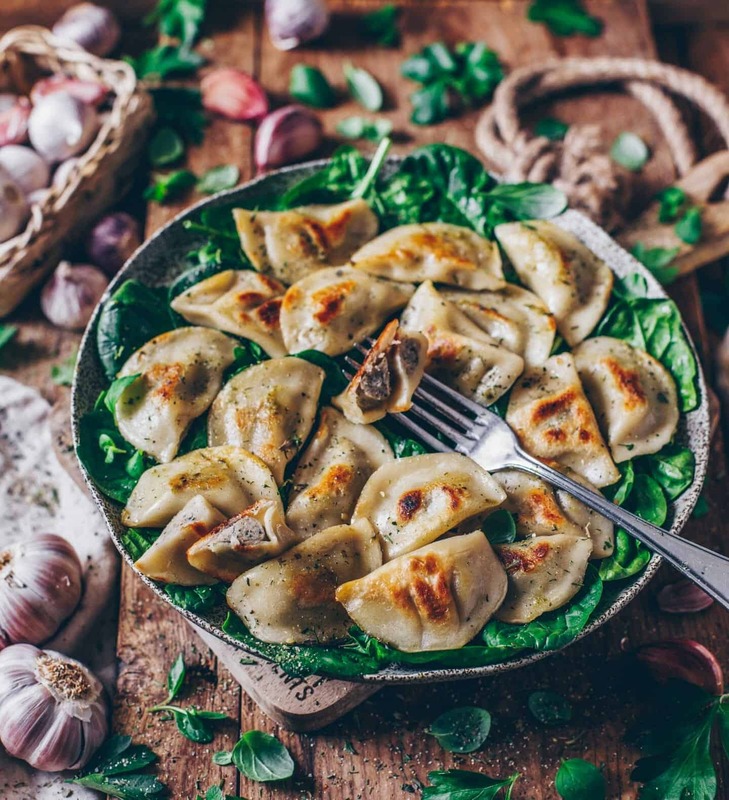 Since I always share my recipes with a great passion, it was very important to me to share this delicious recipe for vegan pierogi with you, which I eat and love since my childhood. 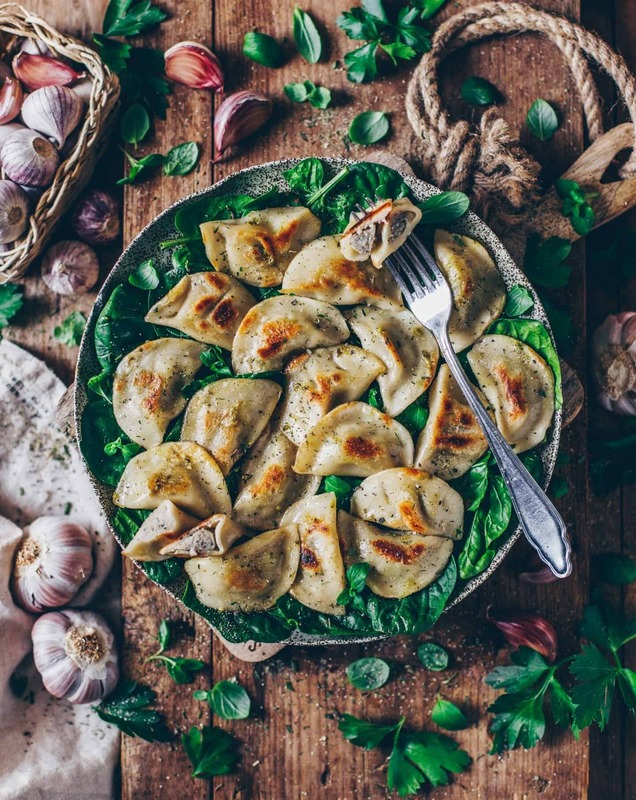 Vegan Pierogi are stuffed pasta dumplings (vegan ravioli), which my Polish grandma cooks very often and which I always loved. At grandma’s Home, it always tastes the best, right? That’s why I made it to my mission to create one of my favorite dishes myself. Of course in a vegan, healthy and delicious version. The dough of these vegan pasta dumplings is just made of pasta dough, similar to my recipe for “vegan ravioli hearts” and the filling can be varied as you wish. You can serve them as a starter to a salad or as a main dish. I also like them in combination with my “garlic-basil-parsley pesto“. Anyways, you can also fill these vegan pierogi with any fillings you like. You can add different vegetables, or vegan cream cheese, or pesto. Just be creative because, you know, it’s all about mix and match, right? If you’ve ever tried these vegan ravioli, you‘ll definately know why I love them so much. So now let’s go directly to the recipe for these vegan vegan pierogi. If you like you can leave a comment, if you maybe already know this dish or which dish reminds you of your childhood. Would love to know it. First, mix flour and salt in a bowl and form a hollow in the middle. Stir water, soy yoghurt and olive oil in another bowl. Then pour into the hollow of the flour and stir with a fork. Then form the dough to a ball, wrap it in cling film and leave to rest in the fridge for about 1/2 hour. In the meantime, cook potatoes until soft for the filling. Then drain off the cooking water and peel the potatoes. (Optionally you can also make them with sauerkraut). Peel the onion and cut into small cubes. Clean and cut mushrooms, too. Heat some oil or vegan butter in a pan and fry onions and mushrooms for about 10-15 minutes. Then let the mushroom-onion mixture cool a little bit and purée with potatoes and soy quark in a blender. Season with salt, pepper and herbs to taste. Remove the pasta dough from the fridge and roll it out thinly with a rolling pin on a floured surface. Cut out circles with a pasta or cookie form. Then brush a circle with a little bit of water and spread the filling with a teaspoon in walnut size on the middle of the circle. Fold the filled circle and press the edges well. Once all the pierogi are prepared, bring a large pot of salted water to a boil and cook the pierogi for about 4-6 minutes on low heat. Then remove the pierogi with a skimmer and drain well. Finally, just heat some oil or vegan butter in a pan and roast the pierogi until crispy. If you like, you can also fry some more onions or garlic. Serve them with pesto, spinach and fresh parsley or just by themselves. I‘m happy that you like it ? With a french Russian mom, pierogi, salmon coulibiac and bortsch are some of my favorite childhood food. I never tried to make vegan pierogi, so I’m really excited to find your post! So glad that you like Pierogi, too. I think the vegan version is also very delicious ? I hope you‘ll like it. 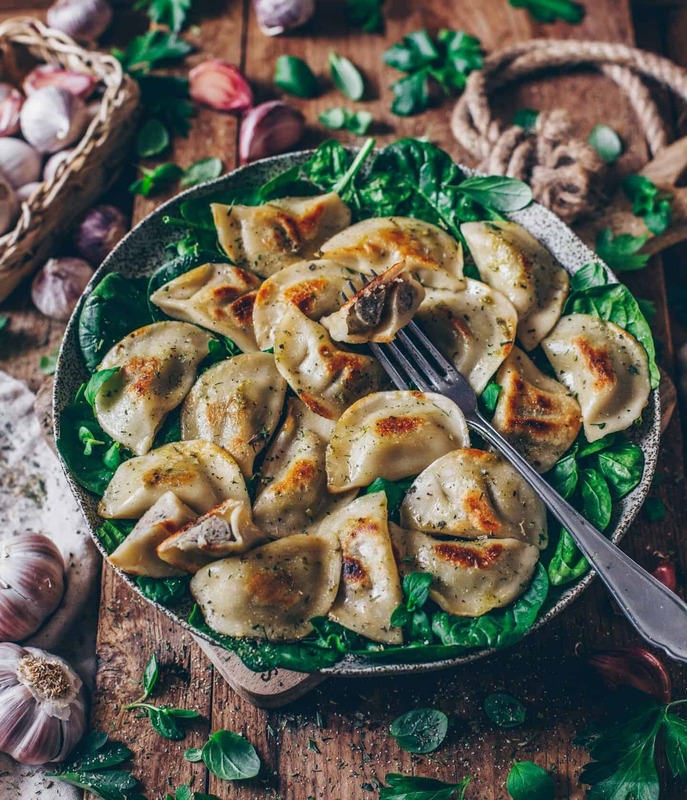 I haven’t had pierogi since becoming vegan so I love this recipe! They look absolutely perfect! Thanks for sharing, Bianca! Glad that you like pierogi ? Would love to hear your feedback if you try the recipe! Glad to read that you like pierogi ? It’s really one of my favorite dishes and so versatile because you can always make another filling ? Pierogi are so delicious but I have avoided them for a long time – but your recipe is simply fabulous and healthy!! Just as a side – I subbed in Bob’s Red Mill gluten free flour and your recipe worked great! I LOVE this recipe! I’ve made it a handful of times now, and it’s a big winner every time. It’s a bit time consuming, so I try to make it ahead of time if I can (get the pierogies all stuffed, and then just stick them in the fridge until I’m ready to cook them). I always serve it with some sauerkraut and it’s the perfect combination. Thank you so much for sharing!